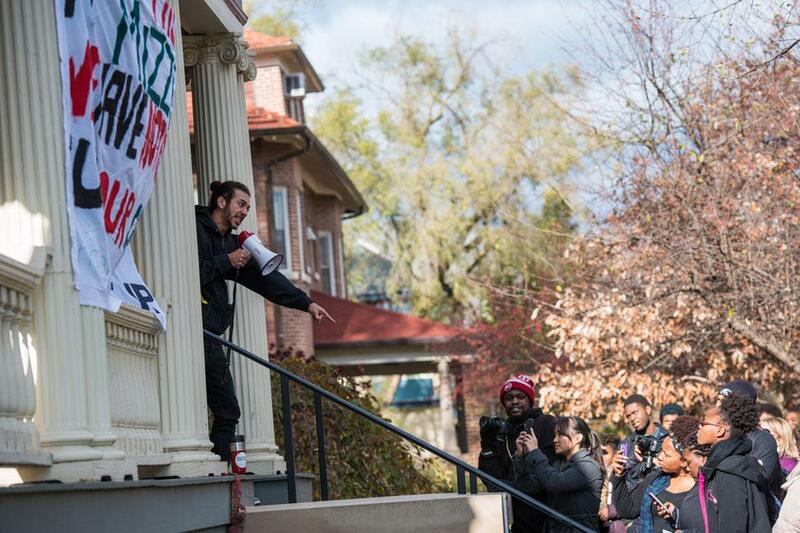 Students gather at the Black House in November 2015 to support students at the University of Missouri and Yale University who protested racial injustice. The NU students later spoke out at the groundbreaking ceremony for the lakeside athletic facility and demanded the University address racial problems on campus. On Monday, the University sent out a report including recommendations to improve the experience of black students at NU. 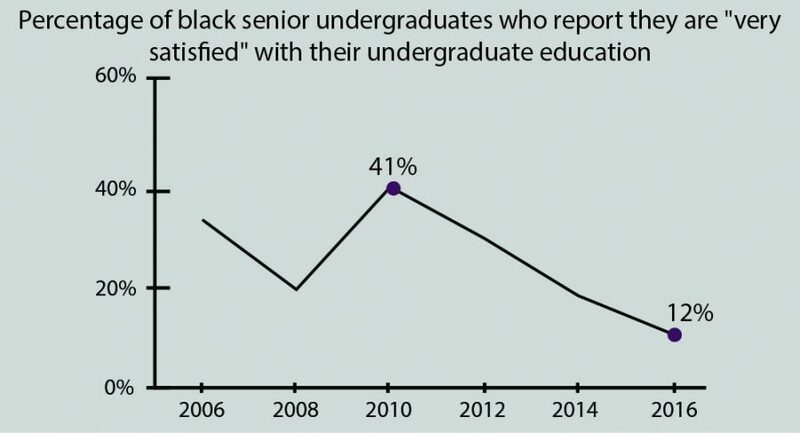 A landmark report sent out Monday gives a data-rich account of black students at Northwestern feeling dissatisfied, exhausted and alienated on campus. The 150-page report, compiled by a University task force, includes 14 recommendations to improve the experience of black students at NU. In part, it recommends the University increase the number of black students, faculty and staff, as well as create a research institute to study cultural competency and administer trainings for NU faculty and staff. It also recommends all undergraduate schools at NU create a social inequalities and diversity course requirement focusing on the United States. In its report, the Black Student Experience Task Force notes the difficulty of describing “a single, all-encompassing” black student experience and recognizes that “intersecting identities must be considered.” But in general, the report explores the ways many black students feel unwelcome and uncomfortable at NU. In surveys and focus groups, students described microaggressions from both faculty and peers. For first-generation college students especially, students talked about not knowing where to seek help when the academic rigor at Northwestern becomes overwhelming. Students also described loneliness from “being the only one” both in social situations as well as science, technology, engineering and mathematics fields. Macs Vinson, Associated Student Government executive vice president and a member of the task force, told The Daily that he is more often than not the only black student in his classes. The task force, which comprised four students and 11 faculty and staff, was created in November 2015 after protests against University plans to move administrative offices into NU’s Black House and Multicultural Center. Many black students, alumni and faculty criticized the proposed changes, pointing out that the Black House has historically been a safe space for black students at NU. After pushback, the University dropped the plans and organized “listening sessions” in which students defended the Black House and criticized the University’s resources for black students. Part of the Black Student Experience Survey asked students for their perceptions of the current campus climate. 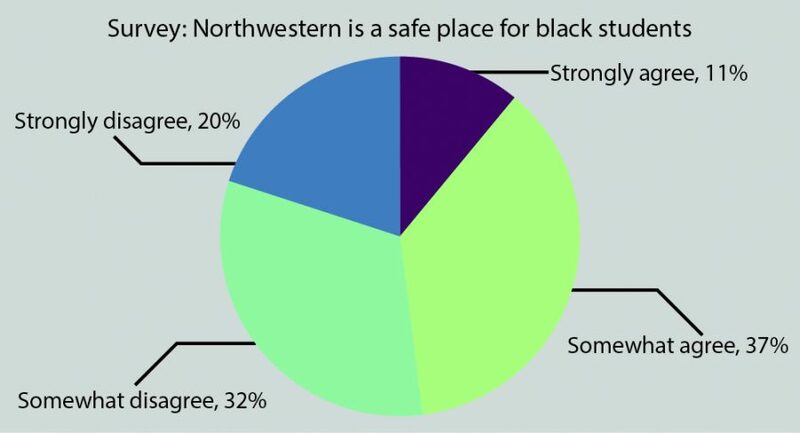 Eleven percent of the students who completed the survey said they “strongly agree” that Northwestern is a safe place for black students. Throughout Winter and Spring quarters, the task force reviewed enrollment data and surveys related to the black student experience. In April, NU faculty and staff facilitated six focus groups at the Black House and the Multicultural Center. Of the 510 black students invited, 63 participated. The task force also sent out a survey to 658 students who either identified as black or both another race and black, and 154 students completed the entire survey. The task force — chaired by Campus Inclusion and Community executive director Lesley-Ann Brown-Henderson — wrote that to increase the number of black students at NU, the University should improve financial aid packages. The report also found black students’ satisfaction with their college experiences “lags behind that of every other racial/ethnic group.” In a survey of seniors, only 12 percent of black students reported being “very satisfied” with their education — compared with 34 percent of white students, 32 percent of Latino students and 22 percent of Asian students. Black students’ satisfaction has been declining continuously since 2010, according to data published in the report. 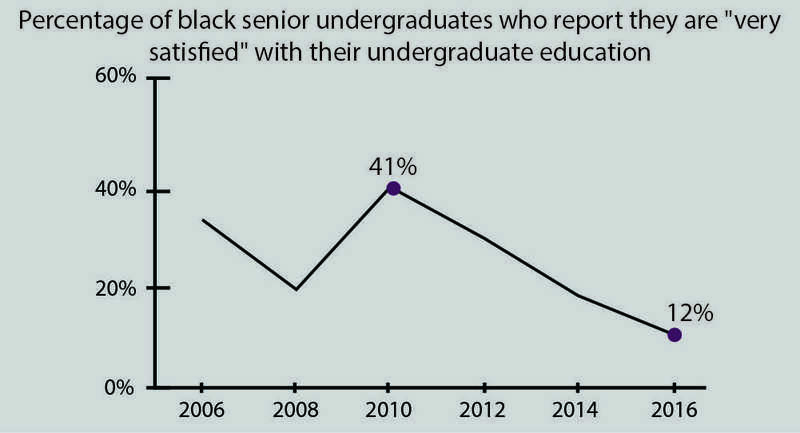 Only 12 percent of black seniors reported in 2016 that they are “very satisfied” with their experience at Northwestern. The percentage has decreased steadily since 2010, and the task force report said incidents such as the Black House controversy last year contributed to this drop. In focus group discussions quoted in the report, black students describe feeling uncomfortable, isolated or neglected by campus institutions. For example, Wildcat Welcome is a difficult, awkward week for many black students, the report says. One student reported he was the only black student in his Peer Adviser group. The task force recommended the University review Wildcat Welcome to find ways to make it “more inclusive and welcoming” for black students. 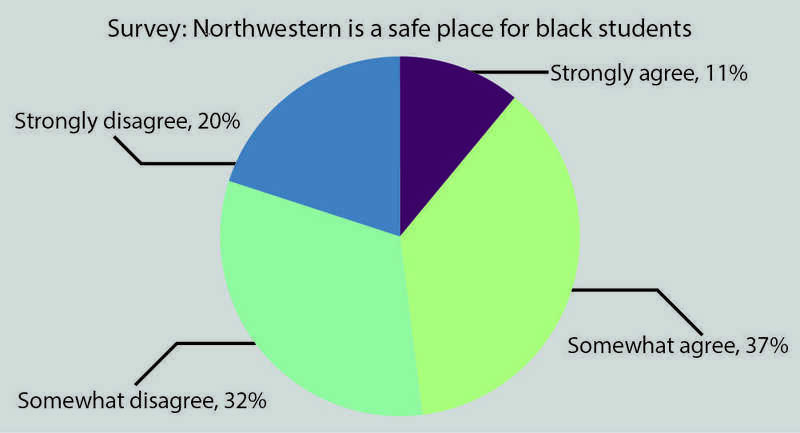 The report also says many black students feel excluded — “or even shunned” — by NU’s Greek community. The task force notes that the University’s most populous Greek councils are predominantly white: According to data from this past spring, only 54 of the 2,628 students who participated in Interfraternity Council or Panhellenic Association were black. Black students reported being ignored at fraternity parties. One said she wasn’t admitted to parties because of her race. Vinson said he hopes the recommendations improve the relationship between University leaders and black students.